Bring Alicia to life right before your eyes with our The Twilight Zone Alicia 3 3/4-Inch Action Figure In Color Series 4 - Convention Exclusive from Bif Bang Pow!. Designed similar to the action figures released in the '70s, this retro-style Alicia action figure features 5 points of articulation (neck, shoulder, and hips). 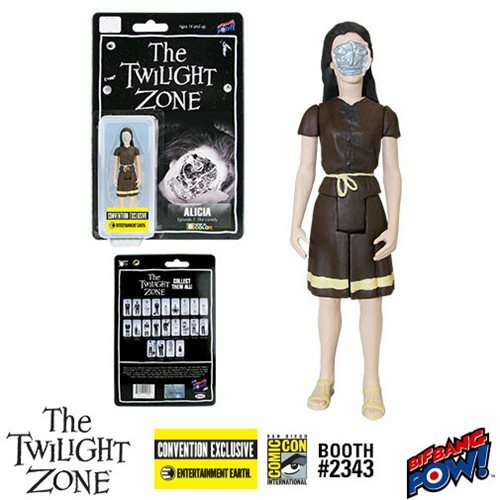 This authentically detailed The Twilight Zone Alicia 3 3/4-Inch Action Figure In Color Series 4 - Convention Exclusive is crafted from plastic on a 3 3/4-inch scale. Plus as an Entertainment Earth Convention Exclusive, each limited edition series 4 action figure is individually numbered with a holographic sticker. Order yours today, and relive your favorite moments from this classic episode in your own home. Ages 14 and up. Enter The Twilight Zone with NEW Female Action Figures – Convention Exclusives!